After more than a year of development, it’s finally, really happening! Bookaboo! 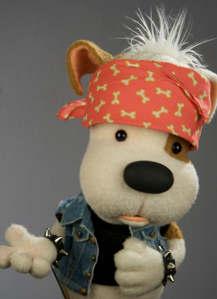 is a new preschool series in the UK (for ITV) about a rock n’ roll puppy drummer who just can't go on without having been read his story. “Bookaboo!” was created by Lucy Goodman and will be produced by her company Happy Films with celebrity guests reading to the puppy. ITV's commission supports the UK's National Year of Reading 2008 effort to promote child and adult literacy. We had worked with Lucy once before about five years ago for the UK Disney Channel series “PJ’s Story Time” and it has been great fun working with her again. She has got to be one of the most creative and energizing producers of children’s media I have ever met. We’re very excited to be a part of her latest project. Click this sentence for more info about the show. We went through many, many design iterations before settling on the right look and feel. But we really didn't find the character until the maquette was sculpted. It was sometimes a frustrating process, but it paid off in the end, I think. Below are some images of the process of building this character from initial concepts to fully realized ‘Boo.